Interstate National Guard Association, Brooklyn, 1902. Callaghan & Company, Chicago, 1909. U.S. Army Intelligence Center and School, Fort Huachuca, Arizona, 1975. Government Printing Office, Washington, 1975. 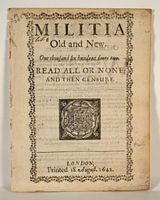 Printed for Mathew Walbancke at Graies-Inne Gate, London, 1647. Military Order of Foreign Wars of the United States, n.p., 1973-83. 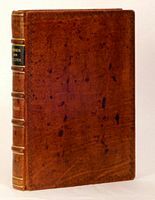 Printed by Charles Eyre and William Strahan [etc. ], London, 1775. Printed under the Superintendence of HMSO, London, 1875]. U.S. Army War College, Carlisle Barracks, 1978. 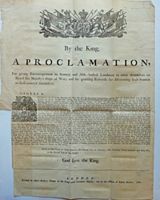 Printed by Thomas Leach, for the Author [etc. ], London, 1660. Printed by B. McMillan, Bow Street, Covent Garden [etc. ], London, 1808. Harrison & Sons, Printers in Ordinary to His Majes, London, 1921. West Publishing Company, St. Paul, 1941. Sumptibus Joh. Nevilsoni, Amsterdam, 1652?. The first joint printing of four works of the noted English civilian repeatedly praised by Holdsworth, who terms the first work "the best specimen of the literature on the theory of law" and Zouche "the earliest English writer on jurisprudence"
Printed by Mark Baskett . . and by the Assigns of Robert Baskett, London, 1762. Walker and Company, New York, 1972. Minnesota Law Review, Minneapolis, 1961. Department of the Army, Washington, 1975-1987. Parker, Furnivall, and Parker, Military Library, Whitehall, London, 1849. Printed by A. Macpherson, Russell court . . . for J. Lee [etc. ], London, n.d.. The Military Order of the Carabao, Washington, 1970. Printed by Mark Baskett . . . and . . . Assigns of Robert Baskett, London, 1765. Stevens and Sons Limited [for the Cambridge Law Journal], London, 1954?]. U.S. Army Intelligence Center and School, Fort Huachuca, 1976. Seemingly the author's personal copy, with the notation in pencil on the front wrap "Professor Avins - Comp Copy"
Printed 18 August 2642 [i.e. 1642], London, 1642. Government Printing Office, Washington, 1938. University of Richmond Law Review, Richmond, 1993. Defense Personnel Security Research Center, Monterey, 1991. Government Printing Office, Washington, 1956. Department of Defense, Washington D.C., 1973.